At GDS we run design training for people from across government. This training helps people find out how design works in building government services. The courses we offer are open to designers from all government organisations and anyone else who wants to understand more about design, work with designers or become a designer in the future. GDS Design training has been running for 3 years and so far we've trained more than 430 people. We’re making this design training better by making it more active. We’re using the principle of active learning, which aims to involve students directly in the learning process. 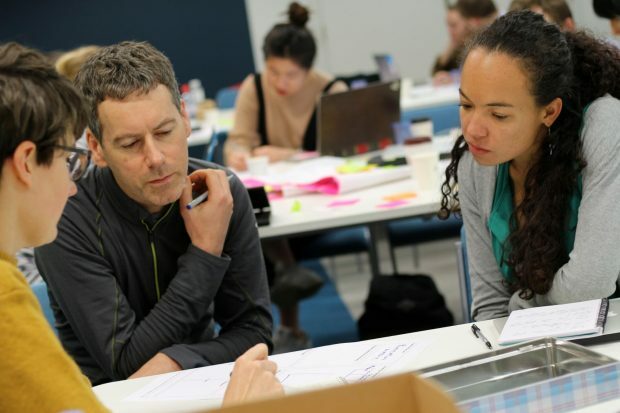 We created the ‘Introduction to service design’ training course this way from scratch and piloted it in January 2018. We’ve also overhauled the 3-day design training course and ran it in February 2018. These training courses are much more engaging because of it, and we will continue to improve them. Active learning is about getting learners to participate in the learning process by planning, doing and reflecting on things, rather than passively receiving information. This helps learners remember and use the new ideas and information because it connects it with their existing understanding. For trainers, the focus is on what they want learners to be able to do differently once they leave the training, and on catering for different learning styles and preferences. Academically, active learning is broadly accepted as the most effective way of learning. This includes collaborative, cooperative and problem-based learning. 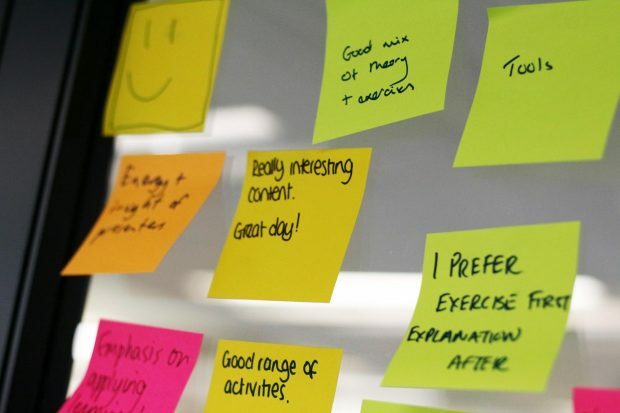 We conduct a retro at the end of each day of training, where trainees put up Post-it notes for what was good, what was not good and any questions. We frequently got feedback such as “too much getting talked at” and “need more practical exercises”. We could also observe the energy in the room change when there were long periods of talking. We knew we could do better. We analysed our data on attendees, conducted interviews with people who had attended and talked to heads of design across government. This helped us understand who was coming to training, why they were coming and what their learning needs were. For each module on our course, we determined what the learning objectives were. These were things we wanted trainees to be able to do, like ‘plan a research and design sprint’, ‘distinguish between created, intrinsic and stated user needs’, ‘write a hypothesis for hypothesis-driven design’ and ‘decide which design pattern applies in a given situation’. We wanted focused objectives, rather than things like ‘understand what research is’ or ‘be aware of accessibility’. We have about one objective for every 30 minutes of training. We brainstormed, designed and refined activities that would help people engage with and understand each of the learning objectives. We tried to vary different activity modes (discussion, reading, writing, making) and group sizes (individual, pairs, tables). This includes activity sheets and templates, slides and handouts. There are about 20 trainers who help run the design training. Most do it on the side while they also work as designers on service teams. It was really hard to get their time to work on training. We’re getting pretty good at presenting. But training takes a different skill set. It includes things like managing and responding to the energy in a room, facilitating a discussion, explaining and managing exercises, and managing different group dynamics and working with different personality types. Turning courses into activity-based training meant that some of our trainers felt like they were having to cut important content out. Doing activities can also feel like you’re no longer in control of the room. But by moving to an active learning model, we have increased the chance that the content will be understood, remembered and acted on. And no presenter is in control of a room if the trainees in it are bored, distracted and not absorbing information. Activities take more time and discussions are harder to timebox than presentations. As well as running training, we’re always looking for ways to create or encourage other learning opportunities, particularly peer learning and on-the-job learning. If you work in a digital team in government and would like to hear about our training, sign up to our newsletter or keep an eye on our training and events page. Follow Clara on Twitter and don't forget to sign up for email alerts.